A safe simple & effective way of eliminating odours & sanitising any indoor environment. 2. Quality of the air volume to be treated. Typical residual odours are from tobacco, body odour, perfume & food. A 200 mg/hr portable unit will effectively treat a 35m2 hotel room in 20-30 minutes. For a room of 50m2 45-55 minutes is required. A 200 mg/hr wall mounted unit will effectively control smoke per 31m2 when operating continuously. 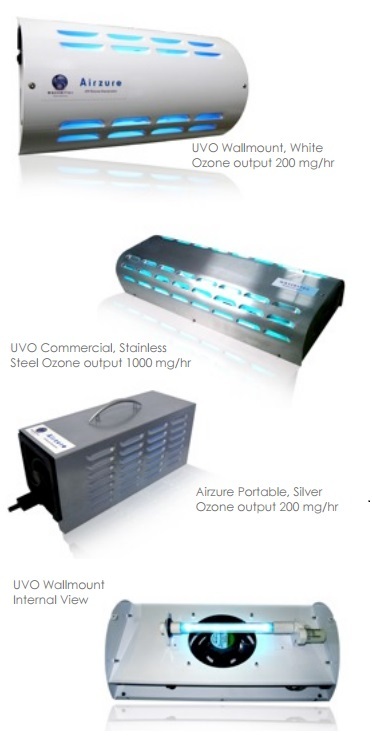 Ozone is used to disinfect air in cold storage rooms. A 200 mg/hr wall mounted unit per 13m2 running continuously will maintain air disinfection. Ozone is effective for controlling odours and bacteria. A 200 mg/hr wall mounted unit per 42m2 running continuously will maintain air disinfection. So Why Use Ultra Violet? We manufacture both corona discharge (CD) and ultra violet (UV) ozone generators. Our experience has taught us that CD is better for water applications and UV is better for air. When used for air treatment CD ozone generators suffer a major disadvantage. They produce an electrical field which attracts dirt particles. This causes contamination of the ozone generating surface, which leads to failure of the surface, the high voltage transformer or both. Also CD is more expensive in this instance. Ultra Violet units on the other hand do not get easily contaminated. They are also extremely easy to service as this simply involves wiping the UV bulb with a cloth and some methylated spirit. 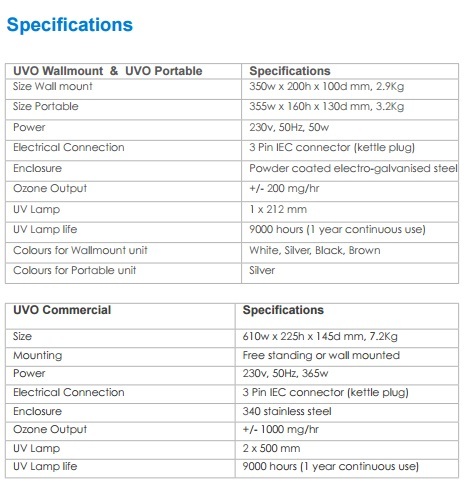 The UV lamp has a 9000 hour working life. Changing the lamp is as easy as changing a lightbulb. Contact Us if you are interested in discussing a project with us or would like some more information please get in touch. Our friendly team are ready to assist you.